Semiconductors have been going sideways for some time, although they have been on a tear recently. Semiconductor companies can vary in the stuff they do, and their performance can also vary significantly. It is best to differentiate between semiconductor companies to get the best returns. Semiconductor stocks are an interesting option for anyone interested in growth. For quite some time, semiconductors did really well. But lately, that has not been the case. In fact, if we look at SOXX (SOXX), a popular ETF for semiconductor stocks, then we see that it has essentially been going sideways since late 2017. The question that some might ask is whether there is another way that is more productive. It is better to gain exposure to semiconductors using an ETF like SOXX or is it better to pick a basket of specific semiconductor companies? To find the answer, we need to take a closer look at SOXX and the semiconductor companies it contains. The chart below is that of SOXX. While SOXX is up 17.07% YTD in 2019, it is still down 3.47% from where it was one year ago. While SOXX may not have gained much over the last 15 months or so, it has seen great volatility during this time period. The question that might interest people is which of the individual stocks that are part of the ETF have done better or worse. Remember that SOXX is an ETF that tracks 30 semiconductor companies. They are Broadcom, Inc. (AVGO), Intel Corp. (INTC), Texas Instruments, Inc. (TXN), Nvidia Corp. (NVDA), Qualcomm Inc. (QCOM), Xilinx Inc. (XLNX), Analog Devices Inc. (ADI), NXP Semiconductors (NXPI), Lam Research Corp. (LRCX), Advanced Micro Devices Inc. (AMD), Applied Materials Inc. (AMAT), Taiwan Semiconductor Manufacturing Company (TSM), Micron Technology Inc. (MU), Microchip Technology Inc. (MCHP), KLA-Tencor Corp. (KLAC), Maxim Integrated Products Inc. (MXIM), Skyworks Solutions Inc. (SWKS), Marvell Technology Group (MRVL), ASML Holding (ASML), ON Semiconductor Corp (ON), Qorvo (QRVO), Teradyne Inc. (TER), Mellanox Technologies (MLNX), Monolithic Power Systems (MPWR), Cree Inc. (CREE), Cypress Semiconductor Corp. (CY), Entegris Inc. (ENTG), MKS Instruments Inc. (MKSI), Silicon Laboratories Inc. (SLAB), and Silicon Motion Technology (SIMO). The table below lists each of the previous companies, their weight within SOXX, and how much they have gained or lost recently. While some are more or less in tune with how SOXX has performed, there are also those who have significantly outperformed SOXX and others who have significantly underperformed. Another popular semiconductor ETF that should be mentioned is SMH (SMH), which can be considered as an alternative to SOXX. Some people may ask which of the two ETFs, SOXX or SMH, is better? In some ways, SMH is better than SOXX. For instance, SMH has a lower expense ratio and the trading volume is much greater compared to SOXX. However, the holdings of SMH are skewed towards a single stock, INTC, with a weight of 13.32%. In all, SMH includes 25 companies. In contrast, SOXX does not have a stock with a weight of more than 9 percent. SOXX includes a greater number of semiconductor stocks at 30, which reduces the chance that a single stock can have an outsized influence on the performance of the ETF as is possible with SMH. The variety and diversity of SOXX gives a more accurate representation of how the semiconductor industry is doing and should from that standpoint be the preferred choice for most people. All of the companies listed previously are grouped under the label of semiconductors, but that is pretty much the only thing they have in common. 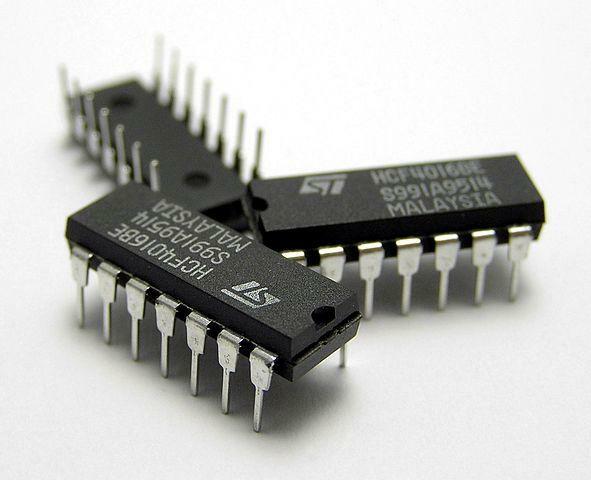 The semiconductor industry can, as a sector, be further divided into various subsectors. Companies that fall under a specific subsector tend to specialize in a certain area. For instance, some companies engage in the design and manufacture of microprocessors, and others focus on memory. Some are fabless chip designers, and others are foundries that manufacture the chip designs of other companies. Each of these subsectors faces its own sets of headwinds and tailwinds. Conditions in one subsector can be good, while bad in another. That can lead to wide divergence between semiconductor companies that are active in different subsectors of the semiconductor industry. Note that the semiconductor industry as a whole can be highly cyclical with boom and busts along the way. What is looking weak in the semiconductor industry? If we look at the performance over the last year, we can notice a few patterns. First, companies that are strongly linked to the smartphone market have struggled. Examples are Qualcomm and Taiwan Semiconductor Manufacturing. The former is down 12.08% from one year ago and down 4.5% YTD, making it the worst performer. Taiwan Semiconductor Manufacturing is down 11.78% and only up by 4.69% YTD. Compared to the sector as a whole, both companies have significantly underperformed. Qualcomm and Nvidia are two companies that have experienced company-specific issues, which have pressured the stock. Ongoing legal disputes with Apple (NASDAQ:AAPL) have affected Qualcomm, which looks likely to continue as long as there is no resolution. Nvidia has to deal with the aftereffects of the cryptocurrency boom coming to an end, which had for quite a while driven strong demand for its products. Nvidia has recently expressed interest in acquiring Mellanox for $6.8 billion. Nvidia was able to beat out a number of competitors, including Intel. However, the deal must pass through regulatory hurdles, including approval from the government in China. It is possible that the deal between Nvidia and Mellanox will fail, similar to what happened between Qualcomm and NXP Semiconductors. Qualcomm provides most of the modem chips needed by smartphones and Taiwan Semiconductor Manufacturing makes the chips for companies that can design chips, but lack the facilities to manufacture them on their own. The bad news here is that the smartphone market declined in 2018 for the first time ever. Shipments were down 5% from the year before. The smartphone boom has for a long time driven demand for semiconductors. Obviously, any company that relies heavily on the smartphone market will see an impact if sales of smartphones are poor. This includes those that make memory chips such as Micron. The smartphone market is the biggest consumer of the dynamic random access memory and NAND flash memory that Micron specializes in. In addition, the memory market is weighed down by the prospect of falling prices due to massive capacity expansion. On the one hand, demand for memory is slowing, and on the other hand, supply is rapidly expanding. Not a good combination for future outlook, even though Micron is highly profitable. So although Micron is up 23.01% YTD, it is still down 29.32% from a year ago. Also under pressure seem to be the semiconductor equipment providers. This includes companies like Applied Materials, which is down 35.14% in one year, and MKS Instruments, down 33.64%. The main issue here seems to be the trade war, which has raised concerns that equipment providers may be faced with severe restrictions with certain customers in Asia. These happen to be the major driving force behind the recent demand for semiconductor equipment. What is doing well in the semiconductor industry? Semiconductor products needed in cloud, data centers and 5G infrastructure are in demand. This should benefit companies that have these products. Two examples of this are Xilinx and Mellanox that have greatly outperformed SOXX. The two are up by 61.1% and 62.72% respectively over the last 12 months. Xilinx is the main supplier of the field-programmable gate array or FPGA, which is an integrated circuit that can be programmed after it has been manufactured. Unlike integrated circuits where logic is typically fixed, the logic in a FPGA can be reconfigured. That allows for a much greater amount of flexibility and adaptability which would otherwise not be possible. FPGAs are heavily used in cloud data centers and 5G infrastructure. All of these are currently set for rapid expansion, which should drive demand for FPGAs and Xilinx by extension. Growth in these fields also benefits Mellanox because it happens to provide the network switches and adapters that are needed in cloud and data centers. Of all the companies listed, AMD is up the most over the last year by 91.81%. However, like Nvidia and Qualcomm, company-specific reasons seem to be driving the stock. The market for microprocessors and graphics processors that are used in personal computers is not that strong. But the emergence of the Ryzen series has created optimism concerning the future prospects of AMD. That helps the company. There are semiconductor companies that have products with a relatively weak outlook and products with a better outlook. Skyworks is an example of this. Skyworks makes products that are needed in 5G infrastructure. But Skyworks is also heavily exposed to weakness in the smartphone market. So it has to deal with both weakness and strength. Qorvo is similar to Skyworks in this regard. Intel is another company experiencing something similar. The personal computer market, where many of its microprocessors are used, is relatively sluggish. But Intel also happens to be a major supplier of FPGAs where demand is good. Qualcomm also deserves mention. It stands to benefit from the 5G rollout even if short-term pressure continues. The semiconductor industry is experiencing some headwinds and some tailwinds. Demand for certain semiconductors is under pressure due to several reasons, including a weak market for smartphones, overcapacity and trade issues. On the other hand, the outlook for semiconductors used in products for cloud, data centers and 5G is much better. In particular, the global introduction of 5G service in the near future should be a catalyst for semiconductor demand. That's because telecom companies will need to rapidly expand 5G base stations to ensure coverage. Companies that have exposure to 5G should be in a position to ride this wave and boost their earnings. In conclusion, it is best to be more selective with semiconductor companies. Pick the ones that are most likely to do well and try to avoid the ones that are likely to experience problems. That means getting exposure to semiconductors through an ETF like SOXX or SMH is not the best idea because they put bad and good companies under one roof. This is a drag on returns, which is not something desirable.